Do you consider this a "gimmick"? Do you object? Let me know what you think. Cross-posted at Heart of Christ. the thing we all work for, the thing that buys us what we need. in Mexico, it’s the peso. What about heaven? What money do they use there? You might say, wait a minute, grace isn’t money. Grace is free! it is grace that gives us security in eternity. And it’s isn’t true to say, grace is free. It’s free to us--but it came at a great cost. which he makes present for us in every Mass. Every Mass we are confronted with the true price of grace. He paid the price of our admission. Grace is our golden ticket to heaven. Do we have it? Or have we lost it, traded it away? That’s what we do when we sin. or for the false security of a lie. And as we heard in the Gospel, hell is real. We don’t want to go there, or help anyone else end up there. there way to make an exchange. That’s what confession is! If you go to Macy's for a 90% off sale, there's a catch: no returns! That's why they give you the discount--they don't want that junk back! a priest is here waiting for you. At Saint Rose, it’s every Friday and Saturday at 11 am. and on Saturdays, noon to 3! Bring all that worthless stuff here! Get a full measure of God’s grace, the gold of heaven! Moses said, oh that God would bestow his Spirit on them all! Tonight begins the most solemn time for the Jewish People: Yom Kippur, the day of atonement. I meant to post something earlier, but didn't get home till just now. 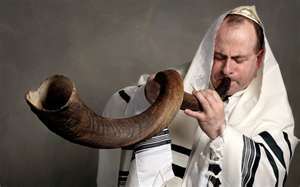 I don't know how many Jewish believers read this blog, but to those who do: a blessed Yom Kippur! 1) The uncountable debt we owe the Jews. God chose them to know his Name, to enter into covenant with him, and be--as Isaiah said--a "light to the nations." 2) This is the day each year when the high priest would offer sacrifice to atone for the people. Those of us who are Christians, of course, think of our Lord Jesus Christ. We need the very same mercy; and the cost paid by our Lord was awful. We can never give enough reflection to what the Cross really means. 3) We Christians must always remember what Saint Paul said in his letter to the Romans: that the role of God's Chosen People in the plan of salvation remains incomplete. God's plan is bigger and more profound than we can possibly imagine. Never dare to think that God would forget his covenant or reject his chosen! 4) We Christians have a duty to consider the special repentance that we owe for the sins committed, in the Lord's name, against his own people, by Christians. The history is more complex, not so cut-and-dried, as some would suggest--for example, there is an inspiring history of the popes being very solicitous and just toward the Jews of Italy, and much of the hostility to the Jews was inspired not so much by Christianity as by the vices Christianity opposes. And yet, how can it not break ones heart to consider that our Jewish elder brothers and sisters would see the Cross, and the name of our Lord, as instruments of oppression? And how did this happen? It happened because of what Christians did. So maybe on Yom Kippur, we might do well to pray for mercy too. Let's go to Fatima & Lourdes! I'm leading a pilgrimage, first time! In association with the Holy Spirit Center, we're going to Fatima, Lourdes and Barcelona next April. Here's the link for what you need to know. Reds Clinch Central! I was there. I didn't decide to go to the game until yesterday; and I was thinking the game was at seven, so my initial plan was to go down earlier, get something to eat at Oktoberfest, and saunter down to the game. Father W., our pastor, stopped in around 2:30 pm--he had two weddings yesterday afternoon at Saint Rose, and was in the rectory between them--and he said he thought the game was at 4 pm. So it was! So I left here around 3 pm, and after hunting for parking, got to the park as our team came onto the field. I knew one of our other priests was at the game, with some friends, so I called him on the way down to see if we could meet up. Thanks to the kindness of a generous layman, Father and his friends were in a prime location, in the field seats along first base. I was planning on standing-room-only if I couldn't get a ticket off a scalper for a reasonable price; in the end, I got a level-100 seat for $35, out in the outfield. So I met up with Father and his friends as the game began. He said there were four open seats next to him; I figured I'd sit there for a bit before the owners of those seats showed up. Well, only two of them--a couple of young kids, whose family was seated somewhere nearby (judging by trips back and forth). So I had a great seat for a great game. All the years I've lived in Cincinnati, I've never been to a game when they clinched the title. It was a full house, which makes it fun; and winning helps! That said, I was at a few games this season, and it was disappointing to see the place less than full, when we have such a good team and a winning season. I realize a lot of folks figure it's terribly expensive to go to a game, but here's something I suspect many don't realize. Did you know you can bring your own food and drinks to the ballpark? No, you can't bring glass bottles or metal cans--and no alcohol--but you can bring food, even a soft-sided cooler, and drinks in sealed, clear-plastic bottles. The cheapest seats at Great American are $5. So with four kids and two adults that's $30 plus tax. Then you bring a cooler and drinks if you don't want to spend a lot on the concessions. There's $5 parking if you don't mind walking a few blocks; and you can get free street parking if you know where and when to look. Parents, you tell me: compared with what other things cost--such as movies or amusement parks--how does that stack up? 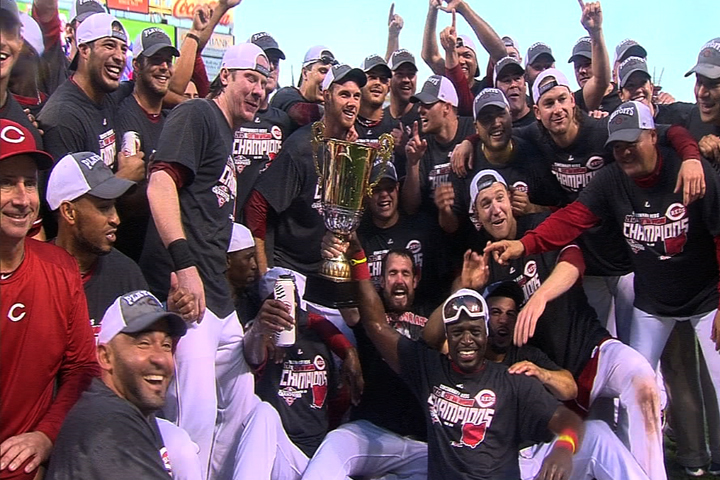 Let me also say this: I think our Reds have done a very good job over the years fostering a family atmosphere. Of course, you will always have some joker who drinks too much or gets too loud, but even when there are fans of the opposing team, our fans seem to keep their good humor. And the management does make it clear, from the get-go, that if anyone is crude or offensive, the ushers will deal with it if prompted. My sense is that the Reds want families to feel welcome. So the game builds toward the climax; the strikeouts are being racked up (if they get 11, all those in attendance can use their ticket to claim free pizza at LaRosas and ice cream at UDF! ), and Father B., sitting next to me--as we passed around the peanuts he brought with him--is wondering if Lato will stay in for the full game. He was pitching a great game, no runs so far; it would be nice to see him finish the game. When the home team got a nice rally going in the eighth, I wondered if the coach would just leave Lato in, since we had a good lead; but he pulled him for a pinch-hitter in hopes of sustaining the rally. When the bottom of the eighth ended, everyone was on his feet cheering the home team, as they now took the field for--we hoped--the final three outs. Here comes Aroldis, the "Cuban Missile" to close it out! Everyone stayed standing for the final three, and with the final out, the whole team rushed the field. The Dodgers in the visitors' bullpen had to trudge past; rough for them, but they can still make the post-season as a wild-card. We hung out a bit as the players hugged and jumped on each other; when they cleared the field, we headed over to one of the new places near the park, Toby Keiths, where a whole bunch of other fans flooded in after us. Have you noticed, Reds fans, that in the past few weeks folks at the game have taken to letting out howls? There was a bit of that at TKS as the six of us--another of Father B. 's friends joined us after the game--had some fun conversation and of course something to eat and to drink. When the band came on around 10, we were ready to go. And I never did make it to Oktoberfest! But what a great day for the home team. If someone asked you, why are you a Catholic, what might be your answer? You might say, because you think it’s true. such as the first reading. But is this why we choose to follow Jesus Christ? Because someone proved it to us? For some of us, that’s part of it. because I thought that was where I would be close to the Lord. So, in my situation, I needed to be convinced of the truth of the Catholic Faith. It took me ten years more. But even then, what brought be back-- what “closed the deal”--was the Lord’s call. Now, till that moment, I would have cited many reasons. A day or two later, I went to that same parish for confession. So just a note: if someone you know says, I don’t know how to go back, that’s how you do it. But back to the question: what makes us choose to follow the Lord? Have we actually made a choice? Or are we just going along? was because they needed to choose. Were they expecting power and glory? all the Apostles--save one--stay with him. Why? What did they experience that would make it worth it? I’m going to tell you. But realize that it’s not enough to grasp it in the mind. We must know it in the heart. The answer is Life. New Life. True Life. Life with God. Life in Christ. To have our sins forgiven and forgotten. And to be united with God for eternity, his Life, our life. What we will have in eternity begins here on earth. The fullness of it is beyond us. But the saints, in their radiance, in their calm, show us a sign, a foretaste, of glory divine. “How do I get there?” Begin here. “How do I gain that promise?” Give yourself to Christ. “But I’m not ready!” That’s what our life as Catholics is about. Getting ready. and you’d give things up that would get in the way. To be a Christian--to live the Catholic life-- is fitness training for heaven. We know why we choose this Faith. Recently I was attending a Mass at which I was concelebrant--and because the number of concelebrants was many, we did not all assemble around the altar, because of lack of room. As a result, many of us were facing the altar throughout the Mass. The celebrant--who I did not know--was, by all indications, a faithful priest. He prayed the prayers in the Missal, and--with a few small things, followed the indicated ritual. In short, he largely "did the red and said the black" as my friend Father John Zuhlsdorf says. Father seemed to be a genial, friendly, cheerful fellow. I did not get to meet him after Mass, but I'm sure we would have had a pleasant conversation. And yet...I wish Mass had been ad orientem--literally, "toward the east," meaning toward "liturgical east," or toward the apse of the church. I.e., all of us facing the same way. Our celebrant had an expressive face; everything he was feeling, showed on his face. And, during the Eucharistic Prayer, Father chose to gaze out at the assembly when speaking many of the words of the prayers. What's wrong with that, you ask? Nothing, if we had been in a conversation. Had we been sitting at a meal, or enjoying a snack or a drink together, it would have been very engaging. We weren't there to engage with him. Now, I am not including the homily--which in this case, was delivered by another. But had he given the sermon, again, I would have been happy to have the priest be every bit as expressive as he was. But when we are praying--when the assembly is praying--why should the priest be our focus? When the priest is standing at the altar, in particular, how much of the prayers during the second half of the Mass, are directed at the others present? The priest says, "pray, brothers and sisters"...then offers a prayer to God. Then he says to us, "Lift up your hearts," and two more invitations, to which we respond. Then he prays the Preface--again, to God. Then the Eucharistic Prayer, which--contrary to what many seem to think--is 100% directed to God. Same with "Through him, with him," etc. Then the priest addresses us briefly to pray the Our Father, then the prayers--again--are to God. Then, briefly, wishing us peace once more, before his attention is back to the Lord with the "Lamb of God." Then he shows us the Lamb, and then he prays, again, to the Lord--with us--in the response. Then his communion and then ours. Then the prayer is again to God, before the blessing and dismissal. My point is, during the second half of the Mass--when the priest is standing almost entirely at the altar--relatively few of the words are directed to us. They are directed to God. To be a priest is to a mediator; the priest mediates our prayers to God, and God's response to us. This is most fully at work in the Mass. Think about it, and you'll see that explains almost everything the priest does in the Mass. So when the priest is at the altar, while obviously the Mass is "for us" to the extent it is for our salvation, the priest's focus is on God. He's pleading for us. He's offering the Eternal Sacrifice--in the person of Christ--for us. Not to us. For us. Please don't misunderstand me. I can hardly blame a priest for feeling joy and love for the Mass, and for it showing in his face. On one level, you could say, "oh, I love seeing it, because it's so inspiring." I get that, too. But I hope people don't come to Mass to see my face--but the face of Christ. A friend of mine (in fact, he has a new blog; click here and go visit!) often refers to priests as "faceless"--meaning, he wants as a priest to "decrease" as St. John the Baptist said, so that He may increase. I understand and agree. It's a reason I think ad orientem serves the good of the people. Because as important as it is to have priests who convey warmth and joy and faith, it is also important that it not be about us. This weekend, after all the Masses, we’re taking up a special collection. To invite back those Catholics who--for whatever reason-- aren’t so active in their Faith. It’s well planned; the ads and materials are top quality. It’s worked well in other parts of the country. So I feel good about asking you to support it. But now we have a dilemma--I bet it happens to you. We want to bring back folks who’ve drifted away, or been turned off. And the temptation is to say, oh, let’s not press not press a particular point. Every week I prepare a homily. and he will ask me to account for how well I taught about him. What will he say? I fear he may say what he said to Peter in today’s Gospel. Because then I will have made the same mistake, trying to have Christ without the Cross. we get little more than cheap, sugary sentiments. Not something worth fighting for, and certainly not worth dying for. what was it that drew people to the Catholic Faith? o be a Christian was to be viewed at least with scorn, if not as an enemy of the state. The early Christians were known for living changed lives. They were faithful in their marriages and refrained from the sexual excess of their culture. They did not throw away their infants if they were “defective”-- as the pagan Romans did. Today, all the studies say that we Catholics no longer stand out from the culture. So here’s the challenge--for me and for you. We’re not only asking you to kick in a few bucks to help with the Catholics Come Home project. We do need that help--thank you. But sharing our Faith isn’t just about good brochures and ads. What am I and what are you prepared to do to help bear witness to our Faith? To help bring folks to know Jesus Christ-- and the life he offers? If you look to the right side of my blog (your right, not mine!) you will see a new blog, "Heart of Christ." this is my new blog. This won't be like Bonfire, which is my personal blog. I created this in service to my task as Director of Priestly Formation for the Archdiocese; that'll be my focus. I'll be posting items of interest primarily for priests: anything that will help them pray better, make a good retreat, be better able to preach, offer Mass, counsel, run their parishes and otherwise, be a better priest. If you're a priest, please link it; please spread the word. Be ready to offer input--I'll be asking for ideas and contributions in the weeks ahead. It was hard to come up with just what I wanted to say; it wasn't until late last night, as I was trying to fall asleep, that I developed what I aimed to do. I posed--and answered--several questions about miracles, such as was described in the Gospel. First, people wonder if these things really happened, or if the Gospel writers made up the stories. My answer is that the Apostles, who told us these stories in the Gospel, gave up everything, ultimately their lives, for what they proclaimed. Why would they do that for a lie? As Blaise Pascal said, "I readily believe those witnesses whose throats are cut." Second, people wonder why miracles like this happen. My answer was that miracles do happen, more than we realize. I talked about the miracles that are documented through the intercession of those being proposed as saints, and I have witnessed things I can't explain. I also said the problem is that no matter how many miracles the Lord performs, people don't change. What happened in the Gospels? And I said: in our own time, God performed a miracle that the whole world witnessed. Really. I recounted how, in 1917, Mary appeared to three children in Fatima, Portugal, and laid out how history would unfold in the 20th century, including a second world war, whole nations annihilated, and--that if people prayed for the conversion of Russia, there would be a period of peace. Then I pointed out how this prophecy was fulfilled--in the end of the Cold War without firing a shot--before the entire world. The third question I posed was, I admitted, the hard one. Why doesn't God perform the miracles we ask for? Honestly, I can't recall all I said here, except that I somehow moved to the point that God didn't come to earth to perform miracles, but to change us. And that lies with us: will we respond? This is where I wanted to make a point but I forgot: namely that when our Lord was on earth, he was always explaining that the main thing he would do is go to the Cross--and people were always fighting that idea. In other words, the transformation we look for will come through death and resurrection. No other way. Along the way I mentioned the dear Little Sisters of the Poor who were collecting funds after Mass, how being part of their work would show us God's power at work. I did make the point that God's power is readily available; in a moment, on the altar, God will perform a miracle right before us. If we're open to it. That's up to us. If you were at Saint Rose today for 10:30 am Mass, let me know if I recounted this correctly! ...to Virginia to visit family, so no homily; took my iPad which I find difficult to use to type, so no psts, sorry! On to Ann arbor tomorrow for a meeting Tuesday, home Wednesday.